This MODIS composite map of Arctic Ocean snow/ice is for the week July 10-16, 2018 (courtesy Canadian Ice Service, NASA). The ice information is updated daily in areas of known marine activity and weekly in remaining Canadian waters. The latest sea surface temperature anomaly map from NOAA/NESDIS featuring a large area of colder-than-normal water in the northern Atlantic Ocean (boxed in region). The Atlantic Multi-decadal Oscillation (AMO) has been identified as a coherent mode of natural variability occurring in the North Atlantic Ocean based upon the average anomalies of sea surface temperatures (SST) in the North Atlantic basin, typically over 0-80°N. One way meteorologists can monitor the AMO is through an index value where positive phases of the AMO coincide with warmer North Atlantic sea surface temperatures and negative phases with colder-than-normal conditions. The AMO is linked with decadal climate fluctuations such as European summer precipitation, Atlantic hurricanes and variations in global temperatures and appears to be directly correlated with Arctic sea ice extent. The monthly values for the AMO index are shown in the plot (below) for the period of 1870-2015 where positive values (red) represent warmer-than-normal time periods and negative values (blue) indicate cold phases. Sea surface temperature cycles have tended to last for two or three decades at a time before phase changes take place. The last major phase change (cold-to-warm) took place right around the mid-point of the 1990’s (indicated by arrow). The AMO index appears to have reached a peak in this current (warm) phase during the latter part of last decade and it has generally been descending during the past few years providing support to the notion that a long-term cool-down may be indeed occurring in the North Atlantic. Arctic sea ice extent has generally been at below-normal levels since the mid-1990s when the shift to a warm phase took place and it was primarily above-normal in the pre- mid-1990s time period during the last cold phase. In recent weeks, the northern part of the Atlantic Ocean has seen a significant drop in temperatures relative-to-normal and this could be the beginning of a longer-term (AMO) phase shift. The below-normal sea surface temperatures are currently focused in the area surrounding the southern half of Greenland and it is very likely contributing to well above-normal snow and ice pack across the world’s largest island. Top: The total daily contribution to the surface mass balance from the entire ice sheet (blue line, Gt/day). 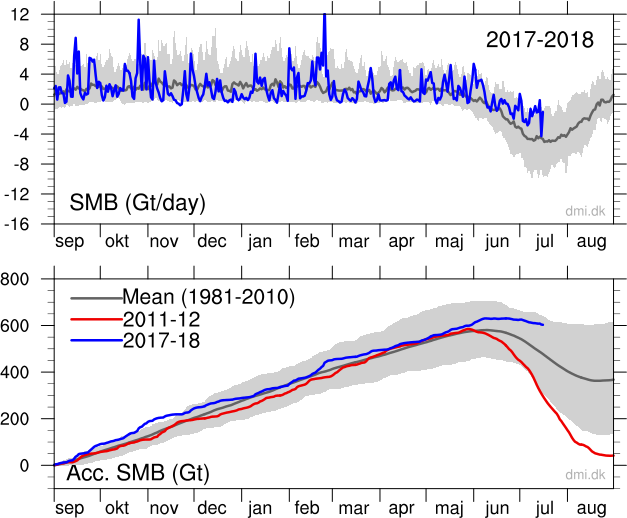 Bottom: The accumulated surface mass balance from September 1st to now (blue line, Gt) and the season 2011-12 (red) which had very high summer melt in Greenland. For comparison, the mean curve from the period 1981-2010 is shown (dark grey). The same calendar day in each of the 30 years (in the period 1981-2010) will have its own value. These differences from year to year are illustrated by the light grey band. For each calendar day, however, the lowest and highest values of the 30 years have been left out. Courtesy Danish Meteorological Institute. In addition to the snow/ice pack on Greenland, this area of colder-than-normal water is likely contributing to the overall colder-than-normal air temperatures in Arctic region. In fact, this continues a long-term temperature trend in that region where there have been warmer-than-normal conditions during the cold season, but normal-to-below normal air temperatures in the all-important summer melting season (for more information on this Arctic region temperature trend click here). Furthermore, the Arctic sea ice extent has been relatively stable for the past several years and the most recent readings have it well above levels in 2012 and in 2007 at this same time of year and not all that far from the lower part of the normal range (based on comparison with the base period 1981-2000). If the trend continues with sustained cooling in the northern Atlantic Ocean (i.e., a sustained AMO phase shift to negative (cold)) then the Arctic sea ice extent will likely climb back into normal or even above-normal levels - much as it was during the last cold phase (pre mid-1990s). An important cold air source region for the Mid-Atlantic region during a given winter season is Greenland and this area becomes especially critical when there are frequent high-latitude blocking patterns in the atmosphere. Low solar activity is often associated with high-latitude blocking wintertime patterns and there is little doubt that the sun will be rather quiet during the upcoming winter season as we head towards the next solar minimum. The snow and ice extent on Greenland is always a useful feature to monitor – even several months before the actual winter season. In fact, Greenland has generally had above-normal snow and ice extent in recent months and continues to do so now as we begin move through the summer season of 2018. Above-normal snow and ice extent in Greenland is a favorable factor for the formation of deep colder-than-normal air masses during the fall and winter seasons when the nights grow longer and longer. [For more information on the early signs of a cold and snowy winter in the Mid-Atlantic region, click here].